The eight leading travel photographers featured here spend their lives roaming the globe capturing just these kinds of images. They have picked their single favourite travel shot from the tens of thousands they’ve snapped throughout their careers, sharing the potent stories behind them, and the lessons amateurs can learn from their success. From feasting polar bears in the Canadian Arctic and dreamy surf locales in Tahiti, to novice monks in Myanmar and remote tribes in Indonesia, these powerful images highlight the importance of qualities such as patience, planning and preparation that all all play a part, as well as a dash of serendipity. We’re certain they will also motivate you to see these magical destinations for yourselves, and to lift your own travel photography to the next level as you do so. 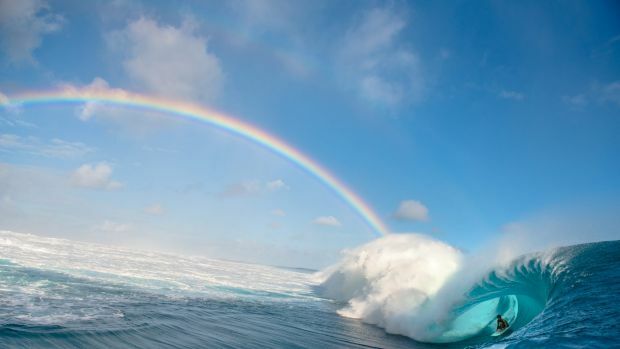 THE IMAGE “Teahupoo Rainbow” was shot in Tahiti, French Polynesia, in May 2015. It took second place in the 2016 Nikon Surf Photo of the Year competition, and was published in White Horses magazine. THE IMAGE “Yalimo” was shot in West Papua, Indonesia, in February 2015. It received an honorable mention in the 2015 Siena International Photo Award, and was a finalist in the 2016 National Geographic Travel Photographer of the Year. THE STORY “I have a passion for visiting remote destinations that haven’t been affected by the outside world, and developed an interest in the Yali people from West Papua in Indonesia. 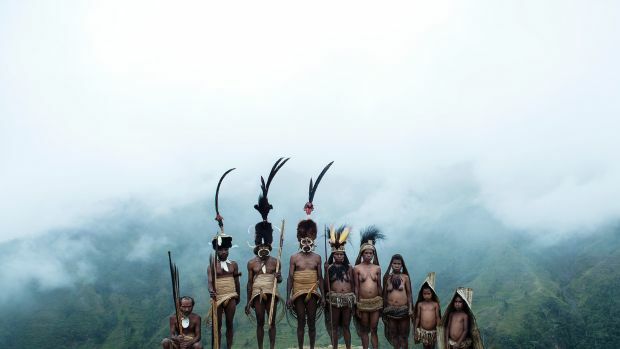 They’re a major tribal group living in a very isolated and inaccessible area of the Jayawijaya Mountains east of the Baliem Valley. “To reach them I hiked for more than 10 days, crossing the Yalimo Mountains and passing through many small villages. It was very hard, especially since I’d just spent two weeks in the jungle with the Korowai tribe and had infections on my feet and was fiscally down. But I knew I couldn’t lose the opportunity to see the Yali, so I pulled myself together and reminded myself that this was a once-in-a-lifetime journey. When I finally arrived, the people, the environment, everything was just magical. Three and a half years ago, Lauren Bath quit her job as a chef to become Australia’s first professional Instagrammer, effectively monetising her social media reach by working in tourism. She now works as a freelance travel photographer and Instagrammer, with clients from Tourism Switzerland to Australia Post. THE IMAGE “Wild Horses” was shot in March 2015 just outside Broome in Western Australia. It has since appeared on National Geographic‘s website, RM Williams’ 2016 calendar and various other publications. 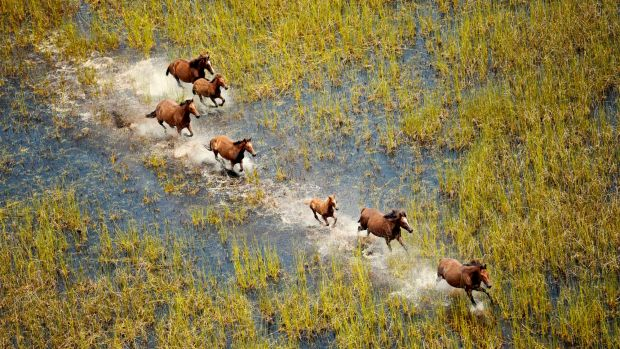 THE STORY “I was visiting a pearl farm close to Broome when my helicopter pilot suggested we fly over a nearby field to photograph the wild horses that live in the area. My first shots were aerials of the herd standing in a field, pretty boring stuff compared with this shot, which was taken when they started to run. “This image is the perfect example of technical skill and luck combining. You can have all the knowledge and skill in the world, but it won’t help you get this shot unless you’re flying over a field of wild horses. Likewise, you can fly over but if you don’t know what you’re doing with your camera you won’t get the shot. THE IMAGE “Looking Forward” was shot by the banks of the Irrawaddy River in a small town near Mandalay, Myanmar, in October 2015. 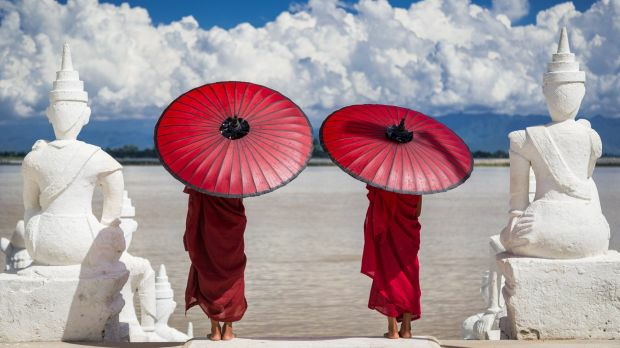 THE STORY “I found these novice monks standing by the Irrawaddy River and was instantly captivated by the contrast of colours – their red robes set against the deep blue sky, with the crisp white statues framing the shot and the moody storm clouds. It was the middle of the day and the lighting was extremely harsh and bright, which made it difficult to capture a correctly exposed photograph, but I knew I had to have the shot. Sydney-based Mund shoots destinations with a “slow travel” philosophy, being a Slow Travel Magazine ambassador, as well as food, editorial and photographic art. She has recently been published in National Geographic magazine, Signature Luxury Travel magazine, Geo and View magazines in Germany. 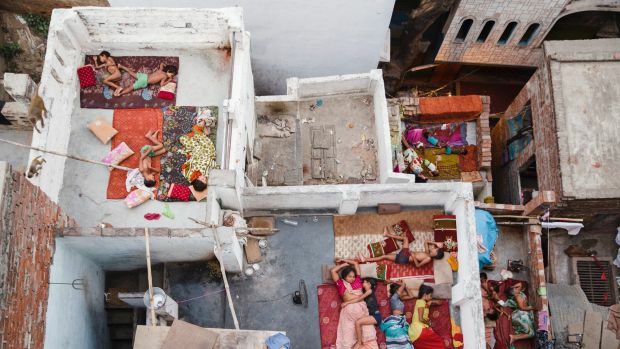 THE IMAGE “Rooftop Dreams”, shot in Varanasi, India, in June 2015, has won multiple awards including second place in the people category of the 2016 National Geographic Travel Photographer of the Year, third place in the 2016 Head On Photo Festival’s landscape prize, and grand prize winner of the 2015 International Photographer of the Year. THE STORY “Last year I spent three months in India and travelled to Varanasi, one of the world’s most holy cities. I arrived at my guest house at 5.30am and instinctively climbed the seven flights of stairs to the rooftop to see the sun rise over the Ganges River. As I looked over the balcony my jaw dropped: below and as far as my eye could see were families – mothers, fathers, brothers, sisters, dogs – all sleeping above their houses. 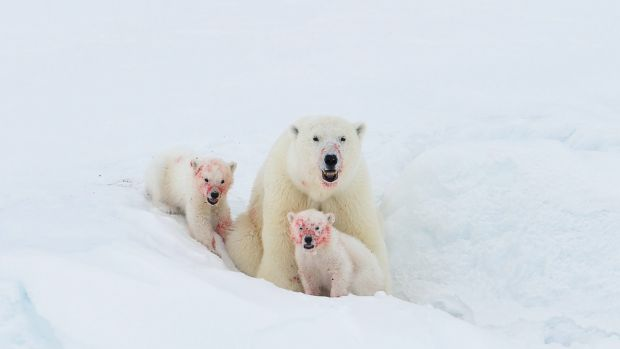 THE IMAGE “Like Mother, Like Cubs” was shot in April 2016, in the Davis Strait in the Canadian Arctic. This photo has not yet been published, but other photos from the series have appeared in The Daily Mail (UK), The Telegraph (UK), National Geographic’s Daily Dozen, and as runner up in the Ocean Conservancy Marine Wildlife photo contest. THE STORY “In April I was on an exploratory trip with a couple of other photographers and some Inuit guides out on the ice in the Davis Strait searching for polar bear mothers with cubs. On this particular day it was getting late and we hadn’t seen any signs of bears. A storm was starting to blow in and we were several hours away from our camp, but just as we were getting ready to head back we spotted a fresh seal carcass at the foot of a huge iceberg. As we moved closer we saw this mother and her two cubs had climbed up onto the berg after gorging on the seal. “At first everything was frantic as we tried to get our snowmobiles into position, grab cameras and get set up in case the bears disappeared over the other side of the berg. But after a couple of minutes, the bears seemed to realise we meant no harm and settled down to relax and play for about 45 minutes. Paola+Murray are a photography duo based in New York, who have been working together since 2010. Ambrosi de Magistris is originally from Rome and Hall from Sydney. They shoot for Conde Nast Traveler, Australian Financial Review Magazine, San Lorenzo Lodges, 5Preview, Upstate, Scosha, Anthropologie and Victoria’s Secret. THE IMAGE “Piz Sella 4” was shot in the Dolomites, Italy, in February 2014, and made the December 2015 cover of Conde Nast Traveler US. THE STORY “It was one of those sweet moments of serendipity. We were in the gondola packed with skiers, in dead time between shots. For once there was nothing to do but look. And of course, as soon as you look you start to see. This little line of skiers were below us, with the sun getting low and the shadows long. The scene was timeless – waiting, shoulders down the piste, no lurid skiwear, nothing much to suggest this wasn’t Ingrid Bergman and Roberto Rossellini in Cortina in 1958. We had to elbow our way to the window and shoot through scratched plexiglass alongside everybody else doing Instagram snaps on iPhones. A few moments and it was gone. THE IMAGE “Zen Palate” was shot in Kyoto, Japan, in 2001. It appeared in Food and Wine Magazine, NY. THE STORY “I was very lucky to have Joe Okada, a very well respected tour guide who works under the name The Last Samurai, as my interpreter on this trip to Japan. Every day he would come to work immaculately dressed in his kimono, calm, serene and respectful. Between shots we would sit and talk and he would make us tea. 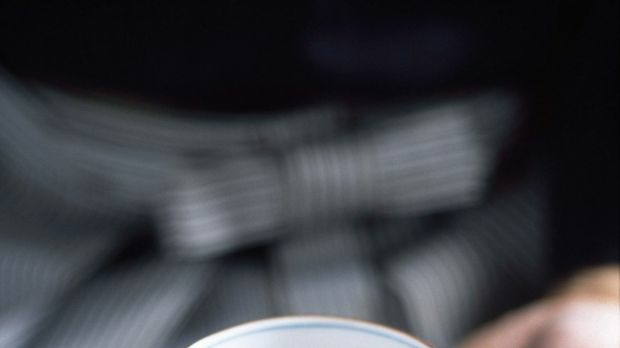 In one moment everything came together – his kimono as the background, his gesture, the tea colouring and the light, and I shot this picture. The mood was perfect.